All of the pages of your website are important – not just your homepage. An often overlooked page is the “About” page. But have you ever thought of the fact that, for some people, your About page might be their entrance to your site (maybe if they’ve found you off a Google search that connected to your About page)? Or for some customers, they may surf over to your About page before they consider taking any of your products or services seriously. So maybe it’s time to seriously rethink your About page. Let’s drive this home with a real life example. There is a Thai restaurant not far from my home here in North Vancouver that I love. I read an article about them in the local paper where they shared their story of how they were a young married couple that took a leap of faith and immigrated to Canada. They opened their own business where they could share their cultural heritage with their new country. It was a lovely story and they seemed like such nice people. And when you go to the restaurant and meet them, they ARE absolutely so delightful and friendly. A while back I had navigated over to their website to have a look at their menu online. I remembered that story from the paper and thought I’d like to read a little more about them in their own words. You guessed it, NO about page on their website. Their wonderful and interesting story was not communicated at all. The very thing that made me a loyal customer was missing from their website, the basis of all their online communications. Can you see the missed opportunity here? So what makes a good about page? 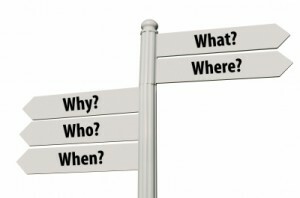 As a basis, your About page should answer the 5 W’s: who, what, where, when, why? Absolutely mention what it is you do, but don’t just stop there. Many small businesses (and even really big ones) just use their About page as another place to talk about products or services. Take it well beyond that. Share your story. Share why it is you are doing what you’re doing. Remember, YOU are the secret sauce of your marketing efforts. And working that into your About page is key. Most people don’t really think about their About page as a place to convert website visitors into buying customers. But if someone likes what you are about and the whole raison d’etre for your business, this could be precisely where they decide to buy from you. Or at the very least remember you when they are ready to buy. BIO WITH PERSONALITY: OK, so obviously your About page is about you, but don’t simply list of a few business accomplishments. This is not a resume. Answer the 5 W’s in an enticing way. How did you get to where you are today? What were the challenges/motivations? Why do you do what you do? What floats your boat? How are you here to help people? Be a story teller here – everyone loves to hear a story. I myself am working at getting more of that into my content, and I just finished writing the story of how I started my own small business – with a link to it from my About section. PICS & VIDS: Adding a few pictures of you (and your team if you have one) can make a big difference and adds a real personal touch to your about page. Make a fun group shot if you’re a team or individual pics for each team member. You could even include a fun little video to introduce yourselves. BIT O’ BRAGGING: Your About page is no place to be modest – this is where you want a potential customer to feel a high degree of trust for you and your business. Highlight those accomplishments! Mention any awards you’ve won or special contributions you’ve made. Include a link to your testimonials. In short, cover off all the reasons why you’re awesome. This can be awkward for some people, but don’t worry, no one can see you blushing. CALL TO ACTIONS: The focus should be on what makes YOU and YOUR COMPANY different and unique, and not so much about your products/services (that’s what your sale pages of your website are for). But as per the points above, you should bring up what you do, who you do it for and how you can help. And definitely include calls to action – they should be on ALL pages of your website, even on the About page. You always want your website visitors to be able to take action, no matter what page they are on. Contact information, join the email list, social media icons, buy something. What have you, make sure the option is there. Living Light Coconut Tree: This about page just brims with authenticity and the good that Rya is bringing to the world with her coconut butter. And it is so original and unique, just like the shining star Rya is. Oliver Harden Photography: Oliver’s about page is full of his personality and sense of humour. He doesn’t need to tell you on this page that he’s a killer photographer. His images speak for themselves. This is where you get a feeling for the type of guy he is. EnergyMatch: Ekaterina works in a nice mix of how she can help you with your business and her own personal journey. OJAS: It’s not just about selling ethical fair trade soap. It’s about sharing, with complete transparency, the whos, the hows and the whys. DK Wong & Associates: When you have to be professional, it doesn’t mean you can’t speak in direct language and share your passion for your business. Indigo Star: Susie shares the story of her business, and why she loves making her sparkly handmade jewellery. Dig Yardscapes: A very boring industry (retaining walls anyone?) made fun. SocialMouths: The full story behind Francisco’s journey to running one of the most successful social media blogs there is. Know that you need a great About page, but hate writing? Or are just struggling to put it all into words? I can help! Writing content is one of my favourite things to do. Let’s work together to create an About page that really gets your ideal customer revved and ready to go. Get in touch with me to find out more. Thank you for mentioning my About page! So appreciate that! My favorite About pages from your list are SocialMouths and Copyblogger – I love these two sites because I learn so much from them. I believe every business should take their About page seriously. Great tips, Martina! My pleasure Ekaterina! Great work on your page 🙂 And yes, aren’t those 2 amazing websites? Just jammed full of great info. 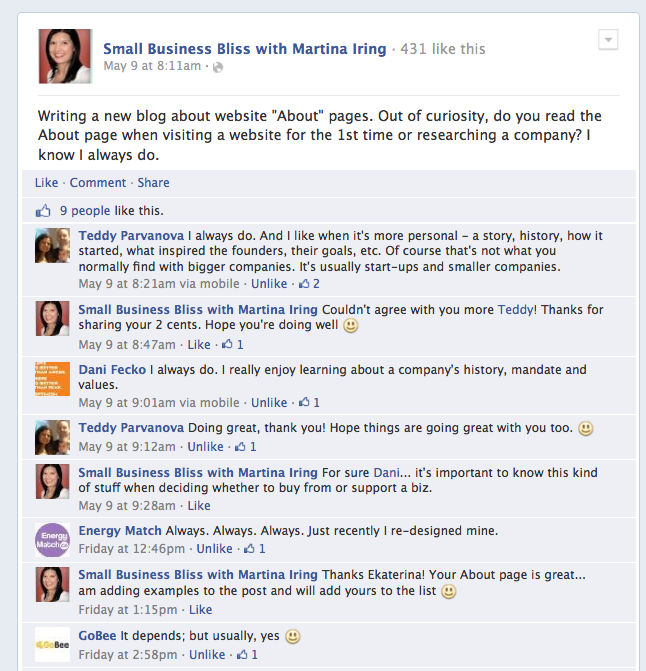 Thanks Marti for sharing my “About” Section! You are so awesome! I’d like to write a blog post that would be appropriate to both my website, and add a link to yours! (Kind of like how I quote Daphnee in my post today and added a link to her website) Not sure the topic yet-it will come when the time is right! Next post: Not blogging? You’re wasting your time on social media!